From the opening minutes of D-Day to the liberation of Paris and beyond - Memoir '44 airdrops you into the key battles that turned the tide in Western Europe. Take command at some of the most historic battles of WWII including: Omaha Beach... Pegasus Bridge... Operation Cobra... and the Ardennes. Memoir '44 is a unique historical boardgame with luxurious miniatures that celebrates the 60th Anniversary of the D-Day Landings. Easy to learn and fast-paced, the game requires strategic card play, timely dice rolling and an aggressive, yet flexible battle plan to achieve victory! NOTE: If more than 2 players, then it's a 'Team Play' game. 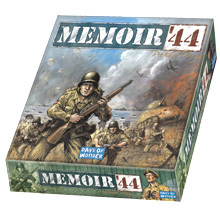 Memoir â€™44 is the latest release from Days of Wonder. Itâ€™s a two-player or two-team game billed on the box as the official game of the 60th anniversary of the D-Day landings. Some gamers may also be interested to know itâ€™s based on Richard Borgâ€™s Commands and Colors Game System which was also used in the Hasbro/Avalon Hill release, Battle Cry. I have had a lot of fun with Battle Cry over the years and Iâ€™m always happy to play another beautiful game from Days of Wonder, so I hope readers will not be surprised to know I have many great things to say about Memoir â€™44. Do I even need to comment on the components of a Days of Wonder game? As weâ€™ve come to expect, the many infantry, armor and artillery figures are very well done. The artwork on the cards is stunning. Iâ€™m always impressed with the level of detail put into these productions. With reference cards, detailed examples in the rules and in this case, even some detailed WWII historical information, I get the impression the Days of Wonder crew stops at nothing to make a great experience for the gamers who buy their products. I was glad I was familiar with the Commands and Colors system when I first saw the 35-page rulebook for Memoir â€™44! Even if you havenâ€™t played Battle Cry, though donâ€™t be intimidated by the large booklet. Much of it is devoted to the various scenarios you can set up. The somewhat long rules section is full of many clear examples throughout. The combat system itself is actually very simple. The new players I taught the game to were able to set up their first scenario and start playing within 20 minutes. For those not familiar with Battle Cry, Iâ€™ll briefly sum up the system. On a turn a player will play one card from his hand. Typically the card will specify a number of units he can give orders to in one of three flanks â€“ left, right or center. Some cards grant special actions allowing for different combinations of units to order. An order consists of a move and possibly a battle. Each type of unit â€“ infantry, armor or artillery â€“ has its own rules for movement and battles. Battles are carried out by rolling a number of special dice. One figure is removed from the targeted hex for each die showing an icon matching the targeted unit type or a hand grenade (which is wild). After battles are resolved, the player will draw a card. Though there are some special cases that arise and terrain affects the rules considerably, I hope itâ€™s evident the basic play of a turn is quite simple. I really appreciate the summary cards included with the game. While I still have to refer to the rulebook occasionally, the cards are a great help during play. They summarize unit abilities and terrain effects very briefly through the use of icons. Rather than passing the rulebook around and trying to sift through all the pages, the cards can be readily at hand to all players. Are there any negatives to this game? Well, I can think of a couple. First, Iâ€™m sure some might say itâ€™s too simple. Iâ€™m not a serious wargamer, so I can only speculate, but the dice-driven combat and use of cards to issue orders make it very possible a great strategy can crumble under the weight of the luck involved. Personally I donâ€™t take this too seriously, as the game clearly excels at what itâ€™s meant to beâ€”a lighter wargame to be enjoyed by teens and families. The rulebook refers to the system as â€œstylizedâ€� and I think that sums it up very well. Details of combat are ignored, offering a fast-paced gameplay that leaves room for some strategy as well as unexpected turns of events. Iâ€™ve found the game plays very quickly and I think that will appeal to todayâ€™s younger gamers far more than the detailed charts and long turns associated with more traditional wargames. Other products in the "Memoir '44" series. Wow! This is the most played game in my collection, and shows no signs of slowing down! Definitely will be including in my all-time favorites. Even though it appears to be a war game at first glance, M44 strikes an awesome balance between wargame and Eurogame. It also provides an interesting twist in that card play determines what order you command to your troops in any given turn. Furthermore, it's easy to learn! A complete battle can be played out in 45 minutes, including set-up, rule learning, and game play. The game is beautifully produced, as are all Days of Wonder games. The components are definitely worth the price tag; add the extreme fun value of this game and you have a game that I would even pay more for! Buy it now and see for yourself!! WOW!!! A wargame that can be played in about an hour. It's suprisingly easy to learn and has a variety of scenarios. What a great way to learn about history - while playing a board game and having fun. I have played this many times - each with different people. I loved the game every time! All scenarios are based on real-time war events. it can be very strategic but good for war and/or action lovers. I give it a 10 out of 10! Memoir '44 is fantastic. A simple, engaging, fast-playing wargame. Terrific variety - every game is different. Gaming doesn't get much better than this. This game is fun to play and it's short!! Great game for new wargamers. Card-based play mechanics are simple yet flexible. Rules are very solid. Good replay value. Colorful. Wonderful components. Awesome game based on some of the great battles of WWII. Double sided hex game board for both beach landing and and mainland combat. each commander deploys troops and vehicles using Command and Tactics cards. very realistic, and requires some serious strategy. one of the best war games available! A favorite of my play group. Best WWII game out there! Easy to learn, fun to play, and it does not take long to play a scenario. With all of the additional expansions available this game will never get old or tired. Great introduction to wargaming! Another Days of Wonder game with excellent components. This is the base game of a great system. If you are looking for an entry level game about war then you can't go wrong with this one. This game is card driven and uses dice to resolve combat. Great two player game. Easy and simple to learn wargame, with a lot of depth, lots of scenarios to go through. Only downside is there is a lot of set up time. This is a scenario-based war game, that is very accessable and easy to learn and play. Best suited for casual gamers as there is quite some luck involved. I certainly wish all wargames were this accessible. Playable in under an hour, tons of great components, historical scenarios that approximate famous battles and offensives just enough to wet your appetite to read more on the depicted battles...well done. This is a great light war-game that can be played by anyone. The components attract bystanders, and the clever card-driven action limits the options each turn to something very managable while still maintaining variety and choice. This is a great game for anyone even remotely interested in WW2. Everyone I've introduced it to loves it, both online and off! I have a friend who is open to playing some of my new, crazy games; he is a history nerd and this game was a major hit. It is great that this game is light enough to be able to explain to a non-gamer and still have fun and experiment with different tactical decisions. It can be frustrating to not be able to give any commands that you want, but as long as you accept and embrace the luck elements that represent the imperfect chain-of-command system in real war, you can have a great time!